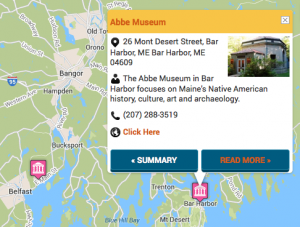 Find Your Maine Winter with Schoodic Institute! 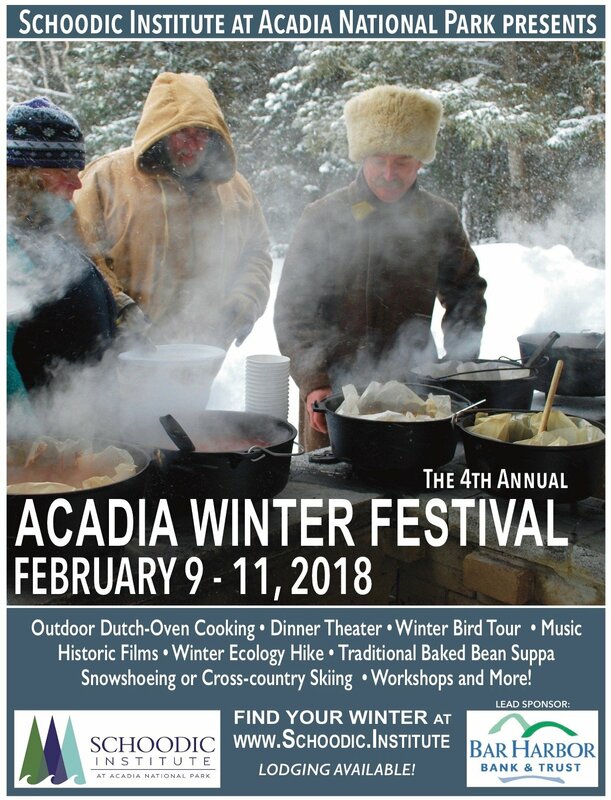 WINTER HARBOR - Schoodic Institute at Acadia National Park hosts the 4th annual Acadia Winter Festival, February 9 - 11, 2018. Friday afternoon with a cross country ski excursion with a Park naturalist in Acadia National Park, Winter Harbor. No snow? No worries - hike the trails instead! Schoodic Institute invites the public to meet and welcome Dr. Don Kent, newly appointed Schoodic Institute President and CEO at a public reception Saturday, February 10, 2018 from 4:00 - 5:30 p.m. Complimentary hors d’oeuvres and beverages will be served. New to the festival this year; Family Dinner Theater with Jude Lamb. Eunice Lakeman married Luther Hoar in 1799. In 1817 they traveled about 20 miles with their 9 children, on foot, from the Avon area to what is now called Rangeley Lake, in Maine. Not only did they travel over late winter snow, but they climbed as much as 1000 feet in elevation. Along the way they had an adventure they did not plan! Hear the story, told in costume, and enjoy a delicious dinner of mixed green salad with house-made maple balsamic dressing; chicken or vegetable pot pie; warm dinner rolls with herb butter; apple cranberry crisp – warm with freshly whipped cream. Cost is only $10.00 per person. 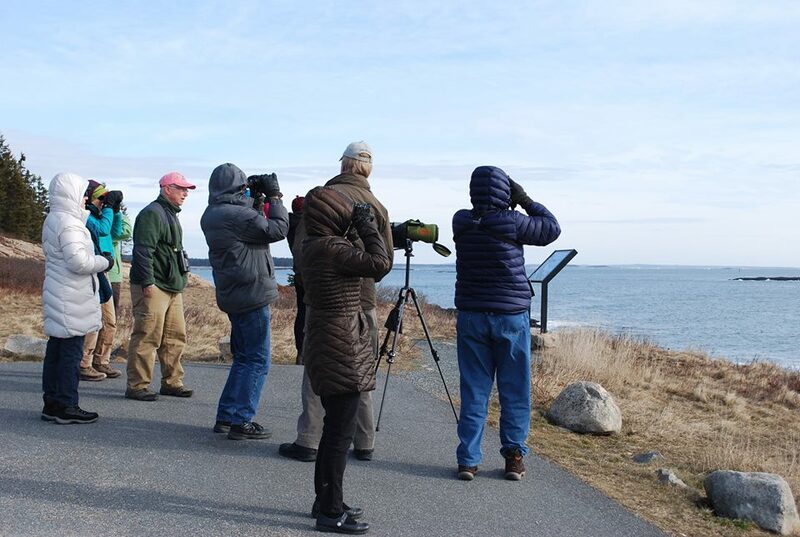 Basics of Chainsaw Safety, Basics of iPhone Photography, Knit a Warm cowl, or take a coastal morning bird walk with Maine Birding Trail founder, Bob Duchesne. Attend a Brown Bag Lunch featuring Northeast Historic Films: Ice Harvesting Sampler, and The Maple Sugaring Story, or a canine search and rescue demo. Kids can take part in a winter scavenger hunt, watch ‘Ice Age’, or learn a few chords and some beginner songs on the ukulele. Music, and a public dessert reception round out the weekend. As always guests can pre-register for hearty, delicious meals and comfortable lodging on campus. Food always attracts a crowd, and so does retired Acadia National Park Ranger Ed Pontbriand’s outdoor dutch oven cooking workshop. In 2017 guests prepared meals and enjoyed their efforts while snow fell. Apple crisp and lasagna seemed to be the crowd favorites. When arctic birds go south for the winter, Maine is often their south. Who are they? Where are they? Come take a look! 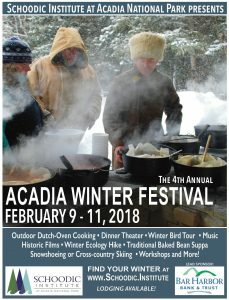 Enjoy a winter ecology hike in Acadia with Schoodic Institute Forest Ecology Director, Nick Fisichelli. Schoodic Institute is an independent 501c3 nonprofit organization committed to guiding present and future generations to greater understanding and appreciation for nature by providing research and learning opportunities through its outstanding Acadia National Park setting, unique coastal Maine facilities, and innovative partnership programs. Visit www.SchoodicInstitute.org to learn more.